1As an art historian, I have always been interested in portraiture. My publications since the 1980s attest to this culminating in The Irish Face. Redefining the Irish Portrait published in 20041. Since the late sixteenth century, portraiture in the visual arts in Ireland has been strongly influenced by English and European traditions and it is only really in the last one hundred years that a more Irish-orientated tradition has evolved. It is the aim of this special issue of Études Irlandaises to explore the role of self-portraiture within the context of Ireland, in terms of both its visual and its literary outputs. 2 See Ciaran Carty, Robert Ballagh, Dublin: Magill, 1986. 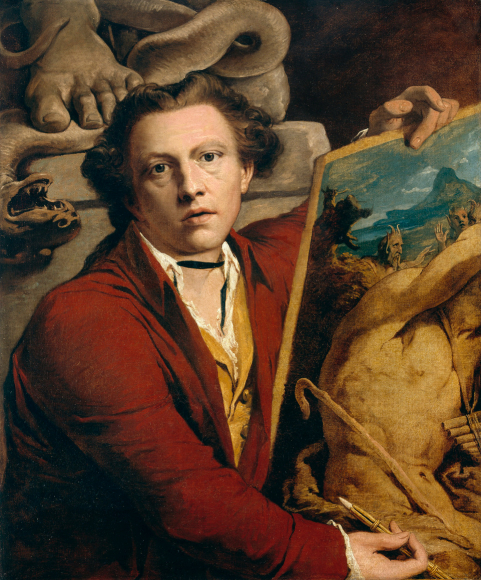 2In the visual arts in Ireland, self-portraiture probably only conjures up a couple of key names, James Barry (1741–1806) in the late eighteenth century, Robert Ballagh (b. 1943) in our own day. With the former you get an awkward even cantankerous individual in a series of oil paintings all produced abroad in either Rome or London while Ballagh’s witty canvases play games with a range of art historical visual references ranging from Dürer to Duchamp2. The fact that only two artists of Irish origin come immediately to mind is surprising as Ireland boasts one of the few national self-portrait collections in the world. Situated on the campus of the University of Limerick, the collection of images is wide in its range from the traditional to the abstract3. In the field of literature, Ireland has a far better range of autobiographical offerings from James Joyce’s A Portrait of the Artists as a Young Man (1916), any number of poems by W.B. Yeats (1865–1939) through to the work of the late Seamus Heaney (1939–2013). Those names just mentioned continue to enjoy undeniable world renown, not a feature attributable to their compatriots in the visual arts. It can thus be said that visual self-portraiture is a poor relation in terms of Irish studies to its literary counterpart. The aim of this issue of Études Irlandaises is to lessen that imbalance and offer an insight into the self-portrayal of the creative mind in both words and images. oil on canvas, 76 x 63 cm, Purchased, 1934, NGI. 971, National Gallery of Ireland Collection. 7 Quoted in Figgis and Rooney, p. 80. 3James Barry’s last self-portrait was completed in 1803 but was started over twenty years earlier. The painting has been in the National Gallery of Ireland since the 1930s4 and in the past half century and more it has become one of the most discussed Irish self-portraits with a literature that extends to well over thirty references5. The most recent discussion of it is by Ruth Kenny in this issue of Études Irlandaises. What has preoccupied much of the analysis of this important picture is the fact that Barry, an autocrat and firm believer in the importance of history painting in the visual arts, painted himself as Timanthes, a late 5th century BC Greek artist. As has been discussed in so much of the literature on Barry, this self-portrait was begun in the early 1780s when the artist was working on his huge series of murals in London’s Society of Arts in which he included himself in one of the wall paintings, the Crowning of the Victors at Olympia6. It is presumed that the oil sketch he made for this mural was left unfinished until two decades later when he was asked to provide a self-portrait for the Society’s Transactions of 1803. Barry returned to that younger representation and painted-in as he said in his own words, ‘the hands, drapery, cyclops, etc’7. 8 Figgis and Rooney, 80. See also, Pressly, 2014, pp. 291-302. 4If what Barry said in 1803 is to be believed and all of the literature on Barry has accepted his account, what we have in this Dublin self-portrait is the face of a forty-year-old man submitted to the Society of Arts as the self-image of what was in fact a man in his sixty-second or sixty-third year. Barry informed the Society that ‘[N]otwithstanding the wear and tear on such a fragile thing as the human countenance’, he and his friends were of the opinion that it still looked like him8. All of this is very well but it highlights an important point about self-portraiture. It can have elements of falsity or can even be delusional. That is, it should never be accepted as pure fact. In self-portraiture, be it in visual or literary form, there is always an element of self-fashioning being transmitted by the artist. 10 Figgis and Rooney, pp. 80-1. 12 Most recently by Pressly, 2014, p. 308. 5A mezzotint that Barry produced about 1802 shows what the doyen of Barry scholarship, William L. Pressly, has referred to as Barry’s ‘crumpled face’ which Pressly goes on to say, “reminds one of Henry Fuseli’s wickedly amusing comment associating Barry’s appearance with that of his decrepit and battered home”9. More recently Nicolas Figgis and Brendan Rooney in their catalogue of the Irish paintings in the National Gallery of Ireland refer to the mezzotint as representing a “haggard and world-weary figure”10. By contrast, the Dublin oil self-portrait shows a vibrant, energetic face. We see a man in his prime, confident in his art whose full-frontal gaze, partially opened mouth and loosely appointed shirt invites us, the viewer, to see him as a creative being. The reality of Barry’s appearance in 1803 and the final production of this oil painting is of course very different. 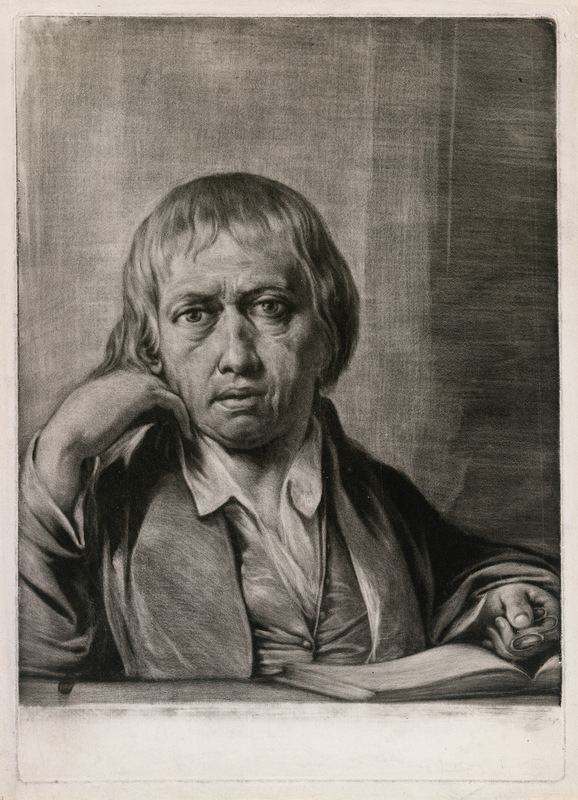 By that year, when the artist returned to the earlier portrait, he was in his sixties, his reputation as a difficult man was well known. A few years earlier in 1799, for a variety of reasons, he had been stripped of his position as Professor of Painting at the London Royal Academy of Arts and expelled from that institution and he was now living in isolation and in poverty11. While the Dublin portrait is frequently seen as a celebration of the Romantic imagination implying freedom of expression, self-determination and the like, such an interpretation only goes so far and is not a very historically useful position to take when viewing the image12. Barry’s final oil self-portrait shies away from a more grim reality. In hiding the artist’s own career disappointments and the banal ravages of time, we need to remember that the examination of self-portraits must be done with a suitable degree of scepticism. 6What an artist offers us in a self-portrait is as much an artificial construct as any other form of art production. It is what the artist wishes us to see, it is their interpretation of themselves and we must work around that offering13. James Barry wishes us to see him as youthful firebrand who is full of energy and creativity, not an ageing and scorned artist. Equipped with such knowledge about Barry’s Dublin self-portrait, we are in a better position to discuss the nature of self-portraiture. 7A key aspect of this collection of essays is that self-examination be it visually orientated or in words must refer to Irish women as much as to Irish men. This issue of Études Irlandaises thus contains essays on such contemporary artists as Amanda Coogan (b. 1971) and Helena Walsh (b. 1979). While the inclusion of only two out of nine essays on women is a serious imbalance, such a ratio reflects the unfortunate situation that stills affects Irish critical writing where women artists and writers are still underrepresented in published comment. 8Another aspect of this collection of essays is to expand the focus of Irish Studies beyond its preoccupation with literary production. While four out of the nine essays are about celebrated writers and poets, be they Samuel Beckett (1906–1989) or Paul Muldoon (b.1951), the remaining five are about the visual arts, both historical and the contemporary. We thus get essays on amongst others, Nathaniel Hone (1718–1784), Seán Keating (1899–1977), and Amanda Coogan. 9In the nine essays in this special issue on self-portraiture for Études Irlandaises we are offered a range of vehicles for the production of self-reflections by artists over a three-hundred-year period. With the visual artists, we see the traditional canvas as a platform for examining the self. But in more contemporary works, we get physical performance as a testing ground for exploring how to represent woman in self-portraiture. In the realm of writing, the platform can move from the arena of poetry as the seemingly perfect site for autobiographical insight. But we are also offered, in the case of Beckett, the private letter as a form of self-portraiture. As Ciaran Ross suggests, the letter acts “to stake control ‘over’ a work”, as the authorial voice can be ‘present’ or ‘absent’ depending on the mood of the artist. 10Themes regarding the approach to self-portraiture that appear in the nine essays that follow are also multitudinous. Many of the writers discussed are on the whole negative in their approach to self-portraiture. We see the author as an ambivalent, hesitant commentator (Beckett) or as a self-derisive voice (Duncan). We also get suggestions of dissatisfaction with the process as it can be frustratingly fragmentary (Muldoon and Mahon). The adult self who is writing is endlessly being reminded of the younger self in recollection. Visual artists are seemingly less dissatisfied. Instead, self-assurance, self-aggrandisement and self-satisfaction are dominant positions adopted by artists from James Latham in the early eighteenth century to Seán Keating two hundred years later. At the same time, the artificiality of self-reflection is a bond that connects both writers and visual artists. Paul Muldoon writes about the fictions that the poet can conjure up about himself which chimes with the fictions that has subjected women to centuries of male representation in art. Fionna Barber’s essay on Coogan asks us to consider the possibility of femmage as opposed to hommage so that women can voice their own story. It is thus possible that, as Barber’s says, “the lineage of women’s art practice” is legitimately articulated. 11Self-portraiture, like much artistic production, has been a male preserve for far too long. It is hoped that this issue of Études Irlandaises rectifies to some degree that imbalance just as this issue may go some way to upgrading the role of the visual in Irish Studies while finally showing that self-portraiture should be viewed as an important ingredient in Irish creativity. 1 Fintan Cullen, The Irish Face. Redefining the Irish Portrait, London: National Portrait Gallery, 2004. 3 See Sarah Finlay, ed., The National Self-Portrait Collection of Ireland, Limerick: University of Limerick Press, 1989) and Ruairí Ó Cuív, ed., Artists’ Century. Irish Self-Portraits and Selected Works, 1900-2000, Oysterhaven, Kinsale: Gandon Editions, 2000. 4 Nicola Figgis and Brendan Rooney, Irish Paintings in the National Gallery of Ireland I, Dublin: National Gallery of Ireland, 2001, p. 78. 5 For recent bibliographies see William L. Pressly, James Barry’s Murals at the Royal Society of Arts: Envisioning a New Public Art, Cork: Cork University Press, 2014, pp. 382-4 and Tom Dunne, ed., James Barry 1741-1806 ‘The Great Historical Painter’, Kinsale: Gandon Editions, 2005, pp. 218-9. 6 See Pressly in Dunne, pp. 61-77 for an account of the Barry self-portraits and for the relevant Society of Artists’ mural, see Pressly, 2014, pp. 63-83. 9 William L. Pressly, James Barry. The Artist as Hero, London: The Tate Gallery, 1983, pp. 153-4. 11 See William L. Pressly, The Life and Art of James Barry, New Haven and London: Yale University Press, 1981, pp. 138-141 and Liam Lenihan, The Writings of James Barry and the Genre of History Painting, 1775-1809, Farnham: Ashgate, 2014, pp. 156-60. 13 For fuller discussions of some of these topics see Shearer West, Portraiture, Oxford: Oxford University Press, 2004, chapter 7 and James Hall, ‘Why Self-Portraits?’ in Facing the World. Self-portraits from Rembrandt to Ai Weiwei, Köln: Snoeck, 2016, pp. 12-21. Fintan Cullen is a Professor of the History of Art at the University of Nottingham, UK. His books include Ireland on Show. Art, Union, and Nationhood (2012); The Irish Face. Redefining the Irish Portrait (2004); Sources on Irish Art. A Reader (2000); Visual Politics. The Representation of Ireland 1750-1930 (1997). He is presently working on a study of migration and the Irish in the long nineteenth century. Over the years, he has acted as Deputy Editor of the journal Art History, and in 2005 he co-organised the highly successful National Portrait Gallery, London exhibition ‘Conquering England’. Ireland in Victorian London.